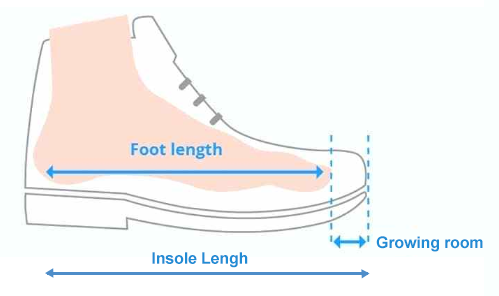 Each of our products has a size guide (under information tab) in which you can see which size corresponds to your child's foot length in centimetres. 1. Have your child stand up with their heels against a wall - make sure your child is standing tall. 2. With a ruler, measure from the back of their heel to the tip of their toes. Measure both feet as one might be bigger than the other. 3. Note down their actual measurements of the bigger foot and then add the following. A. For children under 3 we recommend growing room to be no more than 1cm. B. For children 4 and above we recommend 1cm to1.5cm (1cm for narrow feet). Children's feet often grow in spurts. In order to make sure that your child hasn't outgrown their shoes or boots, it is a good idea to measure their feet approximately once every two months. Between the ages 0-2, children's feet typically grow by approximately 2 cm a year. Between the ages 2-5, however, growth slows down to approximately 1.5 cm a year. Finally, between the ages 6-11, their feet usually grow by approximately 1 cm over the course of a year.